Our Vision To end childhood obesity. Our Mission Wellness in the Schools is a national non-profit that teaches kids healthy habits to learn and live better. How We partner with public schools to provide nutrition and fitness education, healthy scratch-cooked meals and active recess periods. Our approach improves student outcomes and drives systemic, long-term change, shifting school cultures. Why Over one-third of children under the age of 18 in the United States are overweight or obese. Children spend about 12,000 hours in school between kindergarten and high school graduation, making schools the ideal environment to shape their wellness behavior. We teach students cooking skills to make nutritious and delicious meals to bring home to their families. We get kids and their families moving at Family Fitness Fun Nights. We partner with public schools to provide nutrition and fitness education, healthy scratch-cooked meals and active recess periods. Trained culinary graduates partner with cafeteria staff to feed kids real food, and fitness coaches encourage schools to let kids play. Our approach improves student outcomes and drives systemic, long-term change, shifting school cultures and ultimately fighting the childhood obesity epidemic. 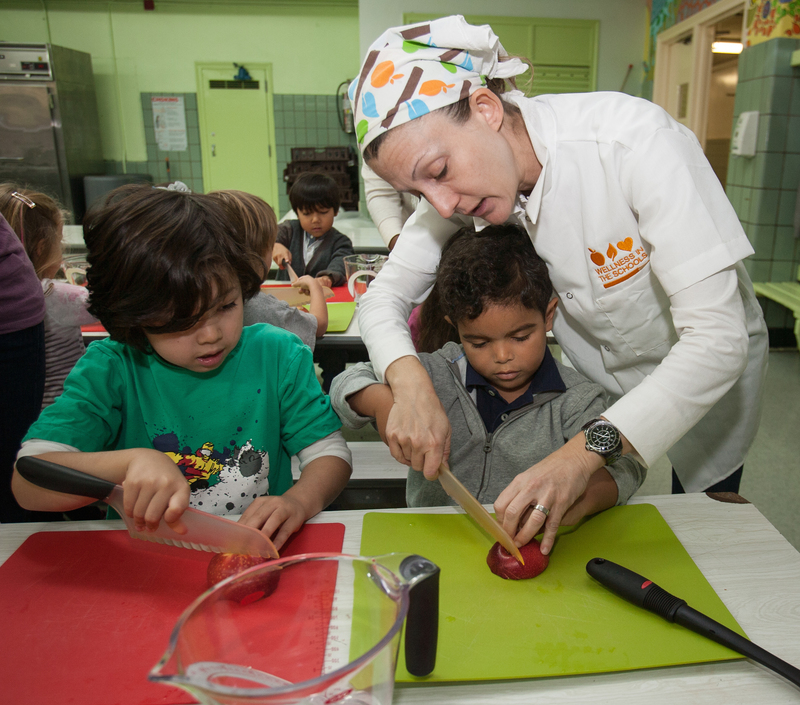 Wellness in the Schools currently works in public schools in Key Biscayne and Liberty City and places a trained culinary professional in the schools to effect change from within the school by working alongside students, teachers, and staff. We provide our students the skill and knowledge to choose healthy ingredients and to make simple health meals for themselves and their families. Wellness in the Schools Chefs, trained culinary graduates, work with schools to transform the cafeteria menu, train school staff, and provide nutrition education to students. Wellness in the Schools Chefs work alongside school food staff in the kitchens, training them in basic culinary skills and scratch-cooked recipe preparation. Topics range from knife skills to storage and organization. WITS Chefs lead WITS Labs, seasonal culinary and nutrition education classes for students in WITS schools. In the Labs, students prepare the simple, affordable and healthy recipes that they will then experience at lunch. Throughout the year, we offer WITS Café Days, where local Chef Partners visit school cafeterias and prepare interactive meals during lunch. These unique experiences encourage students to choose healthy foods and sample new menu items.